Sony admits senior staff bought PlayStation Portable (PSP) handheld consoles from an illegal source but only for investigatory purposes. It is the latest revelation in its legal tussle with Hong Kong import/export firm Lik-Sang. Lik-Sang ceased trading on Monday following legal action from Sony. Announcing its closure, it named Sony executives it said had used its service to get the PSPs before they went on official release in Europe. Sony does not deny that staff bought the game gadgets from Lik-Sang but said it was done to check the nature of the goods that were being sold. This latest battle of words is part of the ongoing war Sony is waging with companies which import so-called grey goods - Asian versions of its products - to the European market without its permission. Last week its legal action against Lik-Sang was validated by a British judge who ruled that it was illegal for the firm to import the Japanese version of PlayStation 3s into Europe ahead of its official release in March 2007. Gamers have been disappointed about Sony's decision to delay the release of the PS3 in Europe , which the firm says is due to stock shortages of vital components. The PS3 console goes on sale in the US and Japan in November. Lik-Sang announced that it was going to close down on Monday, following legal action from Sony. In its out-of-business notice it took the opportunity for a side swipe at Sony. "Sony Europe's very own top directors repeatedly got their Sony PSP hard or software imports in nicely packed Lik-Sang parcels with free Lik-Sang mugs or Lik-Sang badge holders, starting just two days after Japan's official release, as early as 14 December 2004," the notice on its website reads. In a statement to the BBC News website, Sony said the accusations were a case of "sour grapes" and accused Lik-Sang of contravening data protection laws by naming directors. "The purchasing of PSP consoles by SCE employees would be for investigatory purposes. We would also like to express our surprise at a company releasing personal information about its consumers," the statement read. "This release is sour grapes on behalf of Lik-Sang which is aimed to belittle Sony Computer Entertainment and the British judicial system that found against them," it read. The electronics giant has been criticised for its decision to pursue firms such as Lik-Sang. Critics argue that gamers should be able to get their hands on products as soon as they are released in Asia. Sony said that it was using the full scope of the law to block the importing of PlayStation 3s in order to protect consumers from being sold hardware that didn't conform to European safety standards. 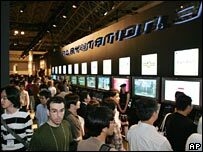 Lik-Sang has said that all the PSP consoles it sold in Europe conformed with EU and UK consumer safety regulations. Its decision to cease trading has elicited a barrage of comments from gamers, annoyed at the way Sony has pursued the firm. Sony denies that its actions had anything to do with the closure of the Lik-Sang website.